"Pam presents a back to basics simple approach to helping your employees understand themselves as professionals while developing a relationship with a customer." "Pam Gockley and her contributors have written a very readable and useful book on innovating company reputation, and it starts and ends with a key fact: Unlike branding, reputation originates in operations, not communications, so the challenge is to match that reality to the expectations (and demands) of the marketplace. This book details a solid way to approach it." "Its been a pleasure to have heard Pam speak at several events. I've heard her deliver a workshop to a group of fundraising professionals, to a large audience of event planners, to a lively group of entrepreneurs, to a large group of academics and business owners and to a free spirited group of career aspiring university upperclassmen. She exhibited a special ability to connect with the audience by making her subject matter relevant and interesting. I will continue to recommend Pam as an interesting and impactful speaker. She's on my "A" list of speakers who make a difference." "I had the pleasure of hearing Pam speak on many occasions, the most recent at the Eastern Pennsylvania Business Owners Association. Pam is a dynamic and thought-provoking speaker. Pam is a very entertaining speaker and she keeps the attention of her audience. Pam's topics are informative and relevant to her audience. I highly recommend Pam Gockley for any group or organization that needs a speaker. She is the best." -- Robin J. Gray, Esq. I have gone to Pam for help in polishing my career. I had just started in the new role of Director of Business Development & Education for my company. I was the first one with this title. I had so many ideas on how to network and promote sales for the business I work for, but, I was overwhelmed with all the ideas and where to start. I had signed on with Pam for several sessions, to start the act of polishing my career. I found Pam to be honest, a straight forward thinker & a person who would look through all the clutter and help me to see things in a much clearer light and also truthful enough to tell me about it. What I really liked about Pam, she is a professional from outside my business with a wealth of knowledge in other areas, I was overlooking. With my new title, no one at my company really knew what to expect. Since I have gone to Pam, I have completely changed my career path. I started with one foot in front of the other & have now proven the worth of this new title. My company is so happy; they have hired more people to fill the position Business Development & Education across ten campuses. I highly recommend Pam and her company to help anyone out there who is in need of professional polish. Pam is also an excellent speaker on many topics. "Pam was very outgoing and engaged the attendees with various questions. She provided helpful hints and gave them things they can implement to make their next expo a success!" "She was very thorough and laid it out very well--attendees just need to put it all into practice!!" "That was great! Thanks again for taking the time to speak to my class." 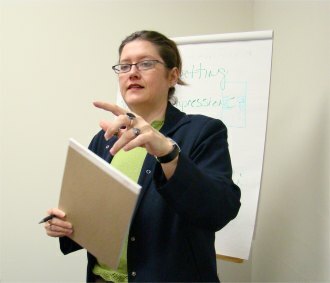 "Pam was a relaxed speaker and enjoyed helping those attending with her expertise of tradeshows. I especially liked how she got everyone involved by asking questions of the attendees." "I think your style is very effective and puts people at ease." "Thank you both. I found the info helpful. I learned some good stuff." "Informative & Concise. Definitely worthy our time." "As a beginner, I was generously introduced to informative and useable information. I also met a variety of new contacts with this seminar and help from the attendees, who specialized in differing areas of writing. I believe I am prepared with the proper tools to create a best-seller, helping people alone the way."